Some people are so insufferably righteous that you can’t stand them. You know the type: in a way you admire them, but those feelings are quickly overcome with the urge to slap them in their fair-trade-buying, bicycle-riding, self-satisfied faces. That’s how Mrs. Iverson feels about Julie. Julie (Marisa Smith) and Peter (Sebastian Kroon) meet at university while Peter is a student at the Sauder School of Business and Julie is studying ecology. Peter’s mom, Annie Iverson (Susan Hogan), is very proud of the path her son’s life is on — she envisions him using his degree in business to get a stable job with a good retirement package, buy a house, and have a couple of grandchildren for her. All of that changes, however, when Peter falls for Julie. He adores her for fighting for what she believes in, no matter what. As Julie travels around the world joining in protests and other forms of activism, Peter watches YouTube videos of her in action and awaits her return. Mrs. Iverson keeps waiting for the ‘Julie Phase’ to pass, but it never does. Mrs. Iverson — Julie never calls her by her first name — tells this story from her kayak as she conjures the ghost of Julie and recounts the series of events that led her to be stranded. Sitting in a kayak for over an hour on stage must be pretty uncomfortable, but Hogan delivers an impressive performance as a distraught mother who tried to protect her son from Julie, the environmental crusader. With humorous, realistic characters, Kayak raises some important questions about the future consequences of our actions, and prompts us to think about our own impact on the environment. However, I felt that the message of the play could have been articulated even more clearly through these characters, and the plot became a bit muddy near the end with what I felt was a false ending and a confusing resolution. Despite this, Kayak is a powerful story, and I’m glad that Jordan Hall was able to incorporate the subject of global warming in his work without it feeling contrived. 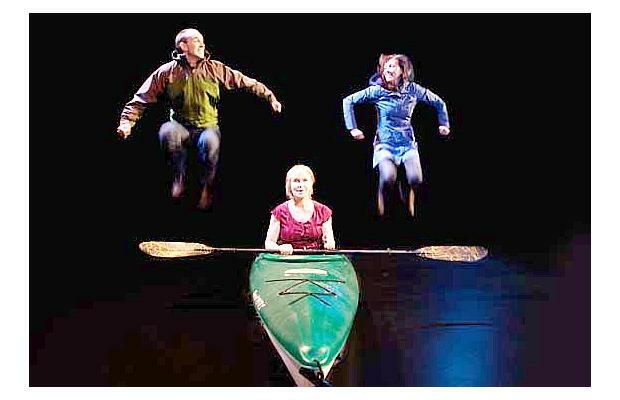 Alley Theatre presents Kayak at the Firehall Arts Centre from January 7–17. For more information, visit firehallartscentre.ca.